-Thinking about buying a new HDTV, projector, or TV set and wondering what size to get? -Ever wonder if your viewing room is set up optimally? -Try this calculator to get some data to guide your decision. If you do not specify a viewing distance, the calculator will tell you what the optimal seating distances are for the selected screen size. This diagram shows the data required to use the calculator and interpret the results. 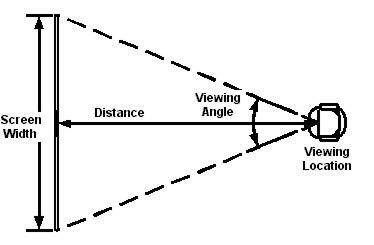 -Current viewing angle: Based on the inputs, this is the viewing angle or arc for your set up. -Maximum recommended viewing distance: Based on data from Electrohome, which suggests a viewing distance of three to six screen widths for video. This corresponds to the point at which most people will begin having trouble picking out details and reading the screen. Probably too far away to be effective for home theater, OK for everyday TV viewing. Most people are comfortable watching TV between this distance and half this distance. -Maximum SMPTE recommended viewing distance: SMPTE standard EG-18-1994 recommends a minimum viewing angle of 30 degrees for movie theaters. This seems to be becoming a de facto standard for front projection home theaters also. Viewing from this distance or closer will result in a more immersive experience, and also lessen eye strain caused by watching a smaller image in a dark room. -Maximum and Recommended THX viewing distances: THX also publishes standards for movie theaters to adhere to for THX certification. THX requires that the back row of seats in a theater have at least a 26 degree viewing angle and recommends a 36 degree viewing angle. -SMPTE and THX screen widths: Based on the viewing distance supplied to the calculator, these are the minimum screen widths required to meet the SMPTE and THX recommendations discussed above. -Viewing Distances based on Visual Acuity: These distances are calculated based on the resolving power of the human eye (reference), or visual acuity. The human eye with 20/20 vision can detect or resolve details as small as 1/60th of a degree of arc. These distances represent the point beyond which some of the detail in the picture is no longer able to be resolved and "blends" with adjacent detail. Click Here for information on vertical viewing angles, or "How high can I put my screen?" Copyright © 2001-2011 C.M.Collins. All rights reserved. This calculator is intended only to give a general idea of proper viewing distances and angles. You need to experiment and find out what works for you and your home. Your actual mileage may vary. Check out what else is on this site!